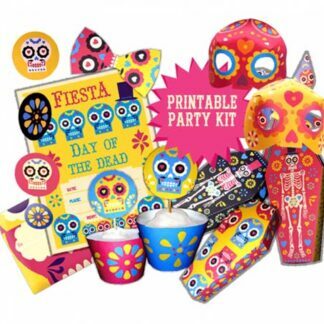 This year we wanted to add a new mask craft idea to our Day of the Dead party kit so we decided to put together some 3D calavera or careta masks, which can be used as a costume, world book day dress up idea or as part of your decorations. Watch this short free video tutorial and see how easy the papercraft PDF masks are to make – Day of the Dead Calavera video – Step by step video tutorial & templates to download! In Mexico, Calavera means skull, also a slang term for daredevil, and calaveritas de azucar are decorative candied sugar skulls made for the DÌa de los Muertos. Like our Lucha Libre masks, these careta masks are really easy to make, so we’re going to make up a whole batch this year and give them out to all our guests. Wear a sugar skull mask or calavera for any Day of the Dead fiesta or Halloween street party. With six different designs to choose from, you and your friends will look the part. 6. Hooray! Your mask is ready. Dia de los Muuertos party printables pack has six more colorful printable careta masks to download. plus a calavera mask to color in. Coloring and decorating your own masks makes a great party activity. For more mask coloring in fanatics see and wrestling maniacs we have Happythought’s 12 Lucha Libre masks to colour in! This also can be great as a class room art workshop or for a learning introduction to Dia de los Muertos or as a teaching Spanish aid. Check out our Day of the Dead craft activity pack for more el Dia de los Muertos craft ideas, templates and papercraft pdf patterns. 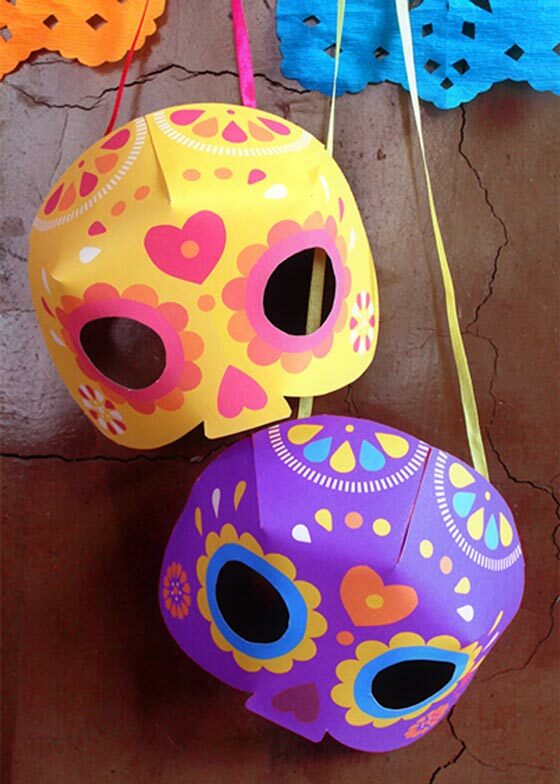 Check out our popular paper flower crown, calavera cat mask and lucha libre mask templates. Plus see our Day of the Dead Glossary here. 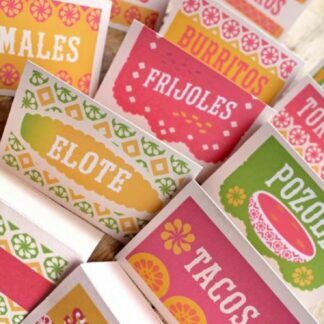 A cool color-in craft activity, paper flower tutorial and how to make papel picado decorations. 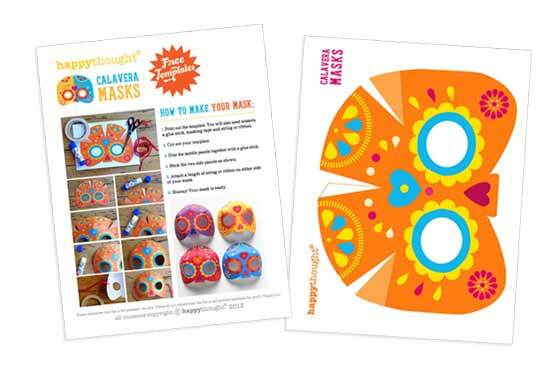 Create your own Calavera mask craft! You might like this fun lucha libre mask craft too? We hope you enjoy our calavera sugar skull mask! If you do, please give us a little love; by liking us on facebook, pinning us on pinterest or following us on twitter. Thank you! Simple mask to put together, yet beautiful too! I would like my first graders to do this cute activity as they learn about El dia de los muertos. Gracias!!!!! me sirven para el cumple de mi hija. Yeah!!! I thought I didn’t receive it, but it had went to my spam… Thank you! We are using it for a Girl Scouts project for Mexican traditions. Love these cute printable careta masks for my Halloween costume! 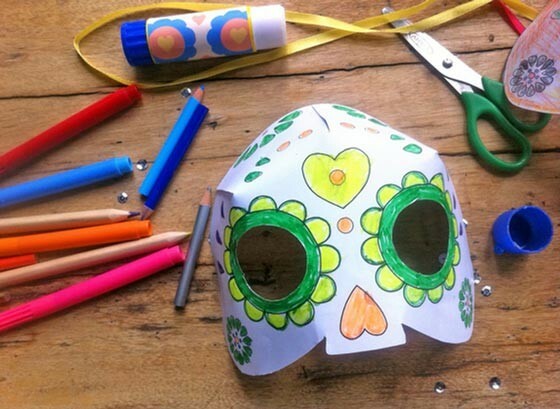 Love this calavera mask template idea..and it’s free!! Love all your ideas and creations!!! Tomorrow, I have a Masquerade Ball to attend, and that idea came in more than handy! I’ll rock one of those and probably stand out, since they’re not very usual around here. Awesome! Thanks a lot, folks! I love this mask craft calavera template! So happy to find these. We need them for a Girl Scout event! Thank you my students will love! Thank you from a Spanish Teacher! Cool! perfect for our afterschool programs! I need these for el dia de los muertos celebration! Hi!! Thanks for this great idea! Can’t wait to use this with my students. This looks like an awesome project for the kids!!! Muchas gracias están hermosas !!! Soooo cute! Can’t wait to make these with my 3rd graders this year! Me encantaron para la escuela de mis hijos!! Thanks for the calavera mask templates! Would love to make these with my class! Thank’s for sharing! I like so much these coloured masks! Would have fun with my nieces and nephews! Wow! Hermoso trabajo. Deje mi mail para recibir el kit imprimible. Yo soy de Argentina y las calaveras del día de los muertos se pusieron de moda! En la ropa, en la deco del hogar! Muy buen trabajo!!! Do you have this type of masks but for animals? I would buy the patterns! Thank you for sharing your masks & template! Gracias por compartir tus mascaras y tu papel picado esto me sive para compartir a mis ninos del cuidado en casa gracias otrabes. Thank You so much…they are great! Perfect craft for visiting spirits at our wedding on Day of the Dead! Would love to use these at our grade 1 dia de los muertos dance! 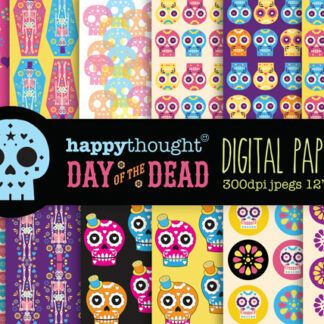 These nice and easy templates will be great for the kids at my Cub pack to make for Halloween/Dia de los muertos. So perfect for my daughter’s halloween (not too scary) party! Thank you!!!!! from teachers that need help with this meaningful tradition.